Season Finale: A new king rises in the north. Tywin promotes Tyrion. Arya leaves King's Landing. Jon's vows are tested. Daenerys finds her fortunes changing. Robb Stark: "I'm going to kill them all!" Stark Camp: News of Ned Stark's execution spreads quickly and Robb Stark vows vengeance on the Lannisters. Catelyn confronts Jaime. Jaime admits that he threw Bran from the window. Catelyn demands to know why, and Jaime replies: "I hoped the fall would kill him." Robb's bannermen debate whether to align with Stannis or Renly Baratheon, who have both claimed the Iron Throne, but there is no agreement. Renly has greater forces, but Stannis is elder and next in line of succession (if Cersei's children are discounted). Jon Umber becomes irritated and questions why the northerners should be told what to do by rulers in the south at all. He declares there is only one king worthy of his respect and allegiance and bows before Robb, calling out, "The King in the North!" The other northern bannermen take up the cry and bow before the new King in the North, swearing fealty to Robb. Lannister Camp: Tywin decides to retreat to Harrenhal, the great castle on the northern shores of Gods Eye, and use it as a base of operations. Impressed by Tyrion's good advice, Tywin appoints him acting King's Hand to Joffrey. Tywin directs Tyrion to bring Cersei and Joffrey to heel and prevent the young king from making more idiotic mistakes. He also tells him to deal with Baelish, Varys, and Pycelle if he detects treachery. Lastly, Tyrion is told Shae (his "whore") cannot accompany him to King's Landing. Tyrion defies him and brings Shae anyway. At Winterfell: Bran dreams again of the three-eyed raven. At The Wall, Jon must decide if his place is in Robb's army or remaining with the Night's Watch. .
At King's Landing: Having been rescued (and disguised with a boy's haircut) by Yoren, Arya begins to travel with his group of Night's Watch recruits north to the wall. With them is Gendry, the former blacksmith's apprentice and one of King Robert's bastards. Sansa is terrorized by King Joffrey. Cersei has taken a new lover: her cousin Lancel who was King Robert's squire. Grand Maester Pycelle sleeps with Ros and does stretching exercises afterwards, revealing to the audience that he is actually far less frail than he appears. Across The Narrow Sea, Daenerys learns that she has lost her baby, Rhaego, and realizes the error she made in trying to keep Drogo alive. His body lives, but is catatonic. The khalasar has moved on and left her behind, with Ser Jorah Mormont and a few members of her retinue. She smothers Drogo. At his funeral, she boldly walks into his funeral pyre. At dawn, Jorah walks into the piles of smoldering ash and finds Daenerys, untouched by the flames and holding three small dragons. She rises from the charred ground with one of the beasts perched on her shoulder. Taking a breath, the creature spreads its wings, releasing a shriek the world hasn't heard for hundreds of years. Joffrey: "I tell you what. I'm gonna give you a present. After I raise my armies, and kill your traitor brother, I'm going to give you his head as well." Sansa: "...or maybe he'll give me yours." * Hot Pie, an orphan and baker's apprentice. * The episode title "Fire and Blood" is the motto of House Targaryen. * The writers showed Ned's severed head at the start of the episode to ensure everyone was clear that he was dead and not coming back. * This episode featured the decapitated head of former president George W. Bush wearing a wig as prop. After an official apology from HBO the episode was pulled from all digital platforms, including HBO Go and iTunes. 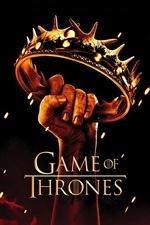 All shipments of the DVD box set featuring the show creators David Benioff and D.B. Weiss commentary that drew attention to the use of the head as a prop, were halted. After editing and altering the head the episode was put back online. * As of this episode, the claimants to the Iron Throne consist of Joffrey (current occupier), Stannis Baratheon and Renly Baratheon. Robb Stark is fighting to win independence for the North. * In the opening credits, the sun tells an important part of the series back story on the astrolabe's panels. It does so in three segments. First, as the credits begin, the sun depicts how the Targaryens and their dragons conquered Westeros. The second time the sun is shown, a dragon is depicted in a mortal struggle with 3 other animals: The Stag, the Lion and the Wolf. It is a very literal way to show how Robert Beratheon and Ned Stark rebelled, with Tywin Lannister reluctantly supporting them, in the end. Finally, the third time the sun is shown, before the series title enter the scene, a lion (among other animals) is shown "kneeling" to a triumphant Stag, just as Robert was crowned King after winning the war. * Sandor Clegane has replaced Ser Barristan Selmy as a member of the Kingsguard. * "Fire and Blood" was nominated for but did not win the Primetime Emmy Award for Outstanding Special Visual Effects for a Series. I remember thinking at the time, with the outrage over Ned Stark, that this episode had to really nail Dany rising from the ashes with the dragons or else risk losing viewers; I hadn't anticipated how strong of a reaction Ned's death would cause. When I had read the book, Ned's death was the moment that made me curious about where the series was going, rather than angry. Fortunately, the moment of Dany standing up and the dragons wrapped around her was fantastic. nubs, that's an interesting point. I'm late to both the books and the show, so I assumed Ned's death was something of an open secret, but I can see how these two episodes pair well, balancing the despair of the sudden and seemingly capricious death of what was a main character with the phoenix-like rise of another young character, full of potential for good. I'll save further musings on Dany vs Eddard for later episodes, and just say this show focuses a lot on how those who treat honor in stark (uhhh) terms of black and white, versus those who realize there are deals to make (and break) to get ahead in the world. I love the little Pycelle scene: it seems almost a throwaway joke, but as well as being revealing of his long game, it's a reminder that everyone on the Council is masked and scheming. Is that scene from the book, or an invention of the show? this show focuses a lot on how those who treat honor in stark (uhhh) terms of black and white, versus those who realize there are deals to make (and break) to get ahead in the world. -Tyrion finally receives some honor and acknowledgement, but still defies his father in terms of following orders. There might be others I missed. Interestingly, I can't think of any women in the story facing this duty/honor conflict, which either is my memory being faulty, or a reflection of the world of the story where that conflict seems to be oriented towards the male characters. For female characters, it's usually more about duty versus freedom. I don't remember him exercising in the books. It is noted in the books, but (I believe) not in that context. I think the idea that concepts like "duty" and "honor" mean anything to Joffrey is unnecessarily generous. Meh, totally disagree (scene came up in a recent episode thread and I decided to post here where it wouldn't be a derail.) It gets tired to make every single character into super-sneaky mastermind scheming unknown angles. Pycelle was a lot more sharply observed as an incompetent dude who has been allowed to be incompetent for basically forever because he's politically convenient, weak-willed, and corrupt, so everyone actually playing the game sees him as a potential asset or at least not a threat. Based on what did make it into the show, all we know is that Pycelle is in better physical shape than he lets on, and he enjoys the company of young women. I don't think he's any kind of mastermind - he's as corrupt and weak-willed as he seems to be, but he's just smart enough to lean into that characterization for his own benefit. There's no long game there. Another puzzle explained. I was curious about the actor Peter Vaughn and siri'd he was in his 90s when he filmed this season (he has since passed away). Which made me curious about Julian Glover who featured in several different Avengers episodes back in the day, he was barely 70, yet he looked like he was about to keel over any minute. Acting.